Portability and protection for your drum hardware! This rugged heavy-duty hardware bag features two rollerblade-style wheels and a reinforced handle for handcart-style ease of portability. Constructed from a heavy-duty nylon material, this bag is lined with a foam padding to protect your equipment. 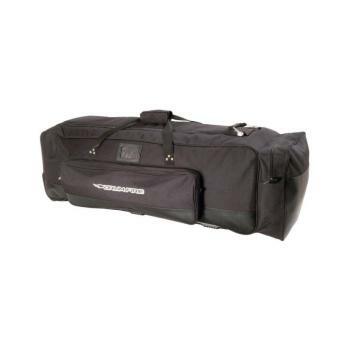 Features a front accessories pocket, top accessories compartment that is sized to fit a drum throne seat, a removable interior vinyl compartment divider and an extra wide double-pull zipper. Holds up to 8 pieces of hardware.